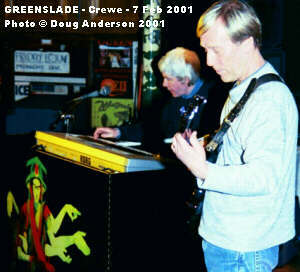 Tonight is the start of Greenslade's second UK tour in four months (the Croydon show having been postponed 'til September due to hall refurbishment) and brought the band to the great venue of the Limelight Club. The venue is extremely well set up and a good place to see, and hear, a band. With raised rear areas and a video screen to keep the punters amused before and after the show the hall serves its purpose well. Having the bar to the rear, chatting punters there don't disturb those who actually want to listen to the music. A little pre-gig waffle to begin the review. This is the first time I've been to Crewe and it was a rather last minute decision. I'd intended taking in the original first date of the tour at the much more local (about an hours drive from home) Ashcroft Theatre in Croydon, south London. Unfortunately the show was postponed just over a week before the tour because of refurbishment work on the theatre. I hope everybody who had tickets found out before traveling to the show. The date has been rescheduled for the end of September. This show will be part of another UK tour, possibility in support of another studio album but more likely a live album from the Rotherham show a few days after this one. Anyway, back to the review. Virgin trains started a 50% discount offer the week of the Crewe show (to attract people back onto the trains after the various problems with tracks and derailments over the previous six months) and so I decided to take advantage of it and 'let the train take the strain'. As well as saving my poor little Fiesta a 300 odd mile round trip taking the train to Crewe gave me a chance to type the review into my Psion on the return journey! This is obviously impossible when I drive and it made a pleasant change to have the review pretty much done before sitting down with an HTML editor to create the web version. The other benefit on this particular occasion was that, getting to the first show, I could post a review on the John Young website the next day to let people know what to expect at Rotherham on Saturday. When I arrived at Crewe station it took me a while to walk to the centre of town - not helped by me missing the sign that would have pointed me in the right direction. I had time to check out the local independent record shop (and I can call it that as it had a reasonable selection of vinyl - unusual these days. As I had no idea where the venue was this was also a good place to ask - especially as they were displaying a poster for the show. In addition to directions I leant a bit about the venue. 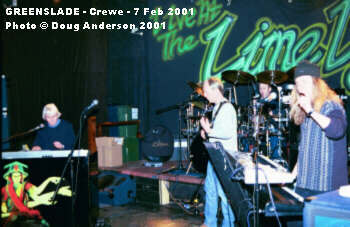 The Limelight club is a nice little 400 capacity venue, situated about five minutes walk from the town centre (though the town centre is a fifteen minute walk from the railway station). It is a 3 level club in a converted church - the music venue section being in what used to be the crypt! Having said that they've not played on the 'crypt' idea at all. In fact the room is well thought out. There is a standing area in front of the stage (roughly half the floor space) with a 4 foot raised area left and right with an even more raised area in the rear quarter of the room. The middle section of this is the bar while the two sides are high enough above the other areas to give an excellent view of the stage. Perfect for photos. Only a few narrow pillars blocked the view from these raised areas but they were easily avoided. A food dispensary provides a handy snack if you've arrived straight from work. It's just a pity there are no venues like this near me. The doors opened at eight thirty allowing punters the chance to buy beer and CDs or just find a good vantage point. With no support band it was nice to have a large video projection screen descend in front of the stage to help pass the time. I'm not sure what some of the audience thought of the choice of video though, 'Owner of a Lonely Heart' by Yes was vaguely compatible but Twisted sister and Metallica were unlikely to be found in the record collections of many of the audience. A little over an hour later, as the video screen rolled back into the ceiling, the band appeared and Dave Greenslade welcomed everybody. He continued "this is our first outing in 25 years" before explaining they'd be playing material off the old albums and the latest one, last years 'Large Afternoon'. 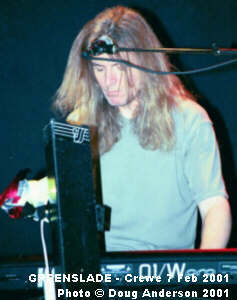 John Young (replacing original second keyboards/vocalist Dave Lawson) slammed closed the door to the stage before adding "if you'd like to step a bit closer..., I know its been 23 years but were not that frightening!" to the crowd who were hugging the sides of the hall. The crowd moved forward a little as the set began, as on the last batch of dates, with a pacey instrumental, CAKEWALK also opened the tour and set with a jaunty tune to attract those still chatting in the upstairs bar..As the final notes faded original member and creative force Dave Greenslade explained "That was the title track off our new album, Large Afternoon. 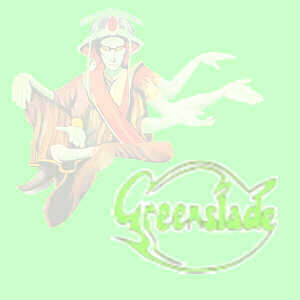 Now we're going right back to the beginning of Greenslade and the first album, the first track, FEATHERED FRIENDS." 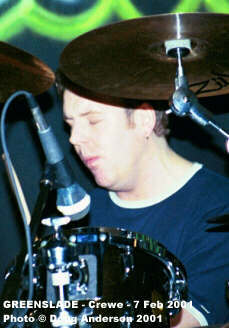 It was counted in by John Trotter ( filling the drum stool in place of Andy McCullough from the original line-up) with his drumsticks before John Young sang the first lyrics of the evening in the mellower sections of the song. 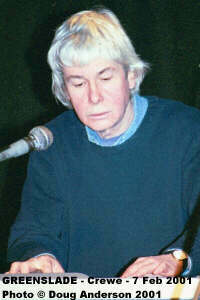 Dave later commented, "Some great lyrics written by Dave Lawson (originally the second keyboard player and vocalist) well before we were worried about greenhouse gasses ." Dave went on to introduce the band, "the newest and youngest member, which is not very difficult John Trotter, keyboard player extraordinary John Young" Tony Reeves next, "a guy who I've been writing with since I was 14 years old" Finally, Tony stepped up to the microphone to introduce, "my oldest sparring partner Mr. Dave Greenslade." Dave played a short, classically inspired, piece before John Trotter kicked in the beat to the meandering piece of music that is CATALAN (off Time & Tide). It is a long workout that showcases many styles and is kept interesting by several time changes. Tony Reeves played some warm bass throughout, stepping forward from his position just in front of the drum riser as the keyboards receded towards the finale. Meanwhile, rhythm partner John Trotter, filled the sound with plenty of hi-hat action. John Young then gave a little background to the next track, "This next song is about the plight of the homeless and how we ignore people that are sleeping rough." NO ROOM (BUT A VIEW). was dedicated to those people and is another track of the latest album and a touch mellower (and certainly shorter) than the previous complex pieces. It has a meaty, pulsing bass and drum rhythm underpinning the vocals. Tony Reeves stepped up to the microphone to tell us that "we'd like to do the title track from the new CD, LARGE AFTERNOON." A hi-hat fill led the others into this racing track with a throbbing backbeat. Dave soon kicked in with the lead fanfares as JY covered the backing keyboards. (The new music was obviously impressing people as, during the track, two people came up and bought a copy of the CD.) On reaching the mid section the music turned towards more jazzy territory before ending. Up to this point the set had stuck firmly to the setist used on the previous tour. Now however it was time to try something different, Dave introducing it thus, "this next piece is a new piece, its called WHEREVER I GO. This is a much more laid back track - a delicate love song. After it John paused before saying, "I just hit one of those buttons that says delete everything" to laughs from the crowd. "Its nice to be back in Crewe" to oohs of disbelief from the crowd - "its not that bad" he added before explaining about how he used to live locally, in Audley. Time for a quick plug next, "A friend of mine is coming here soon, John Wetton" - though strangely not mentioning he may be supporting. Maybe things have still to be finalised around Fish recording sessions. (They had and John did not support Wetton at the show.) He went on to introduce the next track, SUNDANCE, again off the first Greenslade album, which began with wooden pipe sounds before John took over to update the piece. Until this point JY had been providing mainly backing keyboards but for this track he took much of the lead work, really rocking the the number up with some great playing as it progressed. Dave took over towards the end as the music faded back to woodwind. JY spoke again, "Here's a track from the new album, called ON SUITE. Correct?" he checked with the others before adding "which is no relation to Valentyne." It started majestically with drum rolls and keyboard fanfares, mellowing in the middle instrumental section, before dropping down a gear, led by John Trotter, for the final verse. There were a couple of false endings before the piece did finally halt with a drum roll (and a round of applause). It is, in my view, one of the best pieces off 'Large Afternoon' and came over very well in the live setting. Two in a row from the new album but unfortunately (BLUES) IN THE NIGHT is not as impressive a piece, I'm not sure why but it just doesn't hit the spot for me, on the CD or live.JY had "a quick drink before we do a blues tune" which met with little reaction from this, obviously non blues fan, audience. John tried to draw their attention by adding, "this is progressive blues." Progressive it may be but slow it certainly is, very laid back, possibly too laid back. It does improve towards the end but it takes so long to get there though it does showcase the gentler side of the keyboard duo. Tony Reeves had the chance to speak again, taking us "back again to some of the good old this is the title track of the second album, one of those black plastic things we made." He dedicates it, as usual, to "all the doctors in the audience, BEDSIDE MANNERS ARE EXTRA." JY added "you can join in on this one, I know some of you know the words as I talked to you in the bar earlier." A slow start continues into the first verse where the vocal is rather different during this song. It utilises a rather strange, though not unpleasant, tempo which seems to undulate. Dave: "Back to one off the Spyglass Guest album I think, this is JOIE DE VIVRE." JY added "This is the last song of the night - but it's quite long, it was a single..." jokingly. Again the vocals seem to rise and fall making for a rather unusual song. The lyrics soon make way for an extended keyboard extravaganza, expanding the track to around twelve minutes. The rollicking middle section mellowed out towards the end before returning to the main theme and a final verse - Tony ending things with a little leap in the air as if to hammer home the message that the set had finished. In less than a minute the band were back, JY thanking us before inquiring "would you like some more?" He added, "I'd like to thank the Limelight as its ... live music. ... that's why we play overseas." A very laudable comment this is the last tune of the evening and this is SPIRIT (OF THE DANCE) (another from Spyglass Guest), a pacey little number with a several swift time changes along the way to keep the band on their toes. It does miss a real Hammond with Leslies though - crying out for it really! The Trinity sounds just don't compare to the real thing. With a thank you and plug for the merchandise the show was over and the video screen descended. I enjoyed the show much more than I had the first batch of dates, possibly because I was more familiar with the material or, more likely, because I was in a better mood. I'm still not keen on the 70's studio albums but Large Afternoon has grown on me and live the band really comes alive. Playing half a set of new material is, in this case, a good move as it demonstrates that the band is both proud of the new tunes and confident that they stand up against the old classics. All they need is an audience willing to take a chance on a band they've probably never heard before. It was interesting to read the venues magazine, well over half the bands listed were cover/tribute bands. In some ways it is good that these bands keep a venue viable but, on the other hand, people are more likely to pay to see a cover band play tunes they know rather than take a chance on one they've possibly never even heard of. Sad but true. This page was first created in January 2000. Last updated 5 Apr 2001.